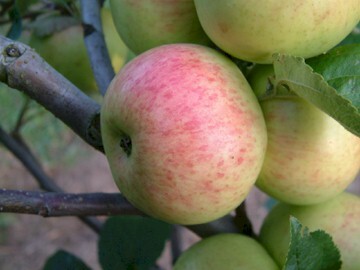 This apple is one of many old American favorites of Russian origin. It arose in the province of Lievland (Lithuania) and was introduced into the United States in 1883. The flesh is fine-grained, juicy and very tender. As described by Calhoun (1995), “the flesh is snow white and the most tender I have eaten – almost like eating foam.” Fruit is medium to large and somewhat flattened on both ends. An early season variety ripening in June to July.